No one could have asked for a more beautiful day for the CALC (Cadillac Area Land Conservancy) Annual Meeting October 7, 2018. Muriel & David Zandstra were wonderful hosts and did a great presentation on “Reclaiming Land for Nature” before taking guests on a tour of their 240-acre property easement in Osceola County. 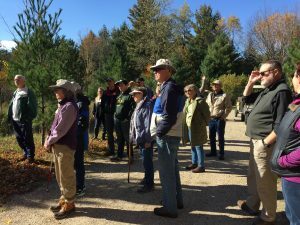 The group on the walking tour listened as Muriel and David Zandstra described how they have been planting native trees, culling invasive plants, enhancing wildlife habitat and removing human litter on their 240-acre easement in Osceola County. This acreage serves as a living model for restoring heavily, human-impacted land. 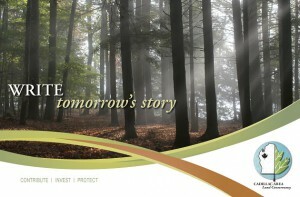 Several ongoing projects demonstrate how such areas can be returned to a natural setting. During the tour, David Zandstra used his excellent presentation skills as a retired teacher to instruct board members Larry Copley and Fred Sprague about the many creative things he has done with the property. 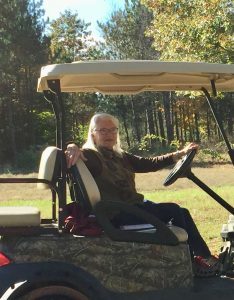 Muriel Zandstra offered golf cart rides for those choosing mobile transportation for the tour.